This is the first "repeat" recipe. By "repeat" I mean I've already posted another recipe from Harry Potter, Butterbeer, which was actually the first entry to this blog. 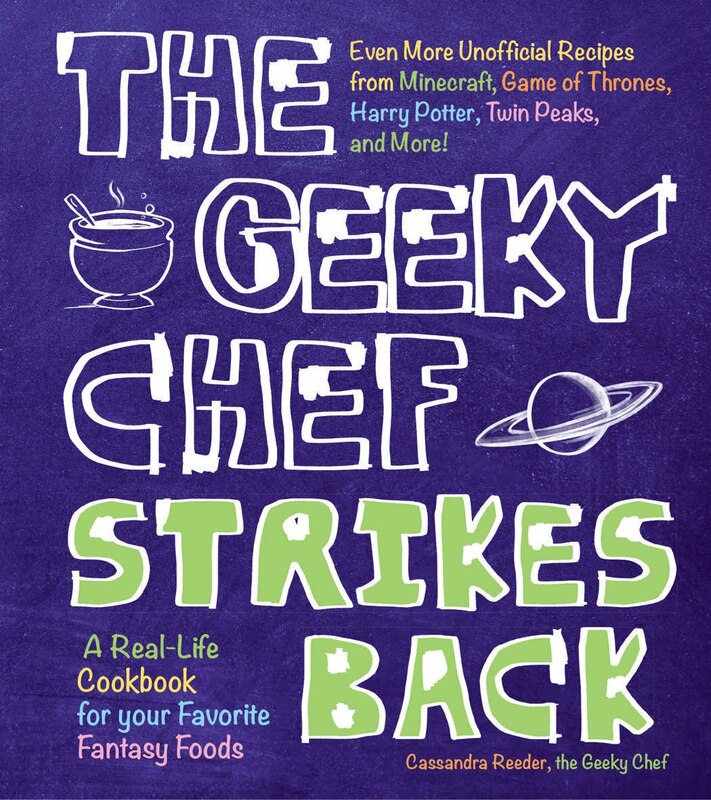 Some nerdy things are just a plethora of tasty-sounding fantasy food, and Harry Potter is one of them. A pasty is a filled pastry case, commonly associated with Cornwall in the UK. It's made by placing filling on a flat pastry shape, usually a circle, and folding it to wrap the filling, crimping the edge to form a seal. The result is a raised semicircular package of yummy. In Harry Potter, Pumpkin Pasties are a wizarding food sold on the Hogwarts Express food trolley, and were enjoyed by Harry and Ron on their first trip to school. 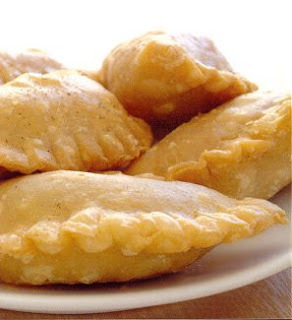 Traditional Cornish pasties are usually savory and filled with diced beef and potatoes, but since the main ingredient is pumpkin and it is sold with other sweets like chocolate frogs and jellybeans, it is assumed that Rowling's pasties are sweet. But, for those of you who always figured Pumpkin Pasties to be savory, here is my recipe recommendation: Savory Pumpkin Pasties. If you don't know how to prep fresh pumpkin, here's some instructions. Add eggs and sugar to a mixing bowl and mix until well blended. Stir in the pumpkin, butter, salt and spices. Add evaporated milk and mix well. Bake the filling in a large casserole dish that has been buttered or sprayed with pam. Bake at 425 degrees for 15 minutes. Reduce temperature to 350 degrees and continue baking for 45 minutes or until your fork comes out clean. Let the filling cool completely. Make or purchase pie crust pastry. Roll pastry thin and cut into circles about 4 inches in diameter. Put a spoonful of the pumpkin mixture towards one side of the center of the circle. Fold over the crust into a half-circle and firmly crimp the edges closed. Cut with a paring knife three small slits in the top for venting. Place on a greased cookie sheet. Bake at 400 degrees only until crust is a light golden brown, around 10 minutes. Brush each with some butter and dust with cinnamon and sugar. This sounds really good!! I want you to make it for me next time we see each other. Reminds me I want to reread all the Harry Potter books. I've left you a little award on my site. Come on over and pick it up. You deserve it for being so unique. How are you? It's Jess, I just noticed your blog - I love it! It's such a great idea! And it's perfectly you. I'm thinking about making the pumpkin goat cheese soup myself. And I love the Hasperat recipe! I went to Star Trek the Experience before it closed in August (still sad about that one...) and Wes and I shared a Warp Core Breach. I'd love to find a recipe of that too! Anyway, now that I've rambled I really miss you and I hope we can catch up sometime. It's been far too long! I hope you're doing well. Ooooo! For a variety of savory treats you should do Scooby Snacks! I used to watch Scooby Doo all the time, and I always wondered what it might have tasted like. I don't understand why you assume pumpkin pasties are sweet just because of the pumpkin. Unless you are from North America? Pumpkin is a vegetable and thus is eaten in savoury dishes outside of the USA. In fact, I know many people who assume pumpkin pie is savoury... just because it has pumpkin in it. Ask people in the UK, and indeed the Commonwealth, and they'll tell you they assumed pumpkin pasties were savoury - firstly because the the vegetable status of the pumpkin, and secondly the savoury status of Cornish pasties. I think it was assumed not due to the pumpkin, but due to the fact that is was being sold with all of the other " sweets"
Just thought I'd point out that Canada (about a third of North America) is, in fact, part of the Commonwealth, and we share Americans' preference for sweet pumpkin dishes! Pumpkins are traditionally cooked sweet in lots of other places, too, like Thailand, Myanmar, the Middle East, and India. As an aside, pumpkins are actually thought to have originated in North America, so I feel like if you want to claim they're "supposed" to be eaten a certain way, the way North Americans eat them might be it. I would firstly like to point out that a pumpkin is a FRUIT. So all your mumbo jumbo about them having to be savory just because they're a vegetable is unfounded. And secondly, haven't you ever had brown sugared carrots? Or candied yams? Sweet Potatoes? All vegetables. All sweet. Bosnian here (nowhere near North America). My grandmothers and great grandmothers all made exclusively sweet pumpkin dishes ever since I can remember. And I would bet their grandmothers did it too, but I only state what I have experienced for myself. And I agree with the first Anonymous, in the Harry Potter world, these pasties were sold on the Hogwarts Express SWEETS cart, there is no way they could be anything other than sweet, no matter what the pumpkin's status is. Anonymous: Pumpkin Pasties are referred to in Harry Potter as treats, first sold on the train's treat cart along with many-flavored jelly beans, chocolate frogs and other sweets. From that it can be assumed that they are sweet regardless of the continent from which you come. You might be surprised that while the term "pie" in North America often refers to sweet dessert pies, it can also refer to meat pies such as those often served in Nachitoches, LA and other places across the U.S. I am sure that pastie is as flexible a term as pie. One more thing...technically, pumpkin is a fruit, not a vegetable as it contains seeds. Look it up. I'm Australian (god save our gracious queen) and I assumed that Pumpkin Pasties were sweet. I also managed to figure out Pumpkin Pies and Pumpkin Scones. Maybe I'm just a pumpkin related genius. I really enjoyed reading over your blog, Cassie - I hope you continue to update! 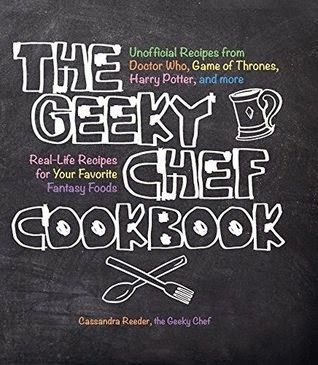 Maybe a good recipe to try would be Yoda's Rootleaf Stew. I used fresh pumpkin because of availability but don't feel it is worth the added work. I made my own crust and had issues of getting the right dough consistency and thickness so the pasties wouldn't crack. I have enough extra pumpkin mixture that I am planning on making another batch of dough to use it up. As for the Pasties themselves, they were great! Its the perfect ratio of crust to filling that I love with anything pumpkin. I'll be making these again. Holy CRAP these things are amazing! I edited your recipe a little bit. I used a 15oz can of Organic Pumpkin pie mix, and removed the cloves and allspice and replaces it with apple pie spice. I also eggwashed the pastries to help the outsides turn gold a bit. Seriously though, I had to stop eating them cause I will eat all 14 that i made and ruin my diet. Is this recipe any different than a normal recipe for pumpkin pie filling? Because I love the idea but would prefer to use my own recipe as it is vegan. @Jennifer, you can use any pie filling. It's just cooked first to make sure the custard is firm and the eggs are cooked (which won't be a problem for a vegan recipe). Also, you don't even really need to cook it on high then reduce it. That's actually a holdover from pumpkin pie recipes where you bake it for 15 minutes on a high temp to keep the crust from getting soggy. I love this website! It's totally awesome! I just made these for our Thanksgiving dinner tomorrow.... but I couldnt help trying one freash out of the oven. They are delicious! Thanks for the recipe! Hello! How many ounces of evaporated milk should it be? ;-) Thanks!! I love this recipe! Thank you so much! I am totally using this for a class project; hope you don't mind! I will tell them that if we eat them, we won't feel so much like muggles. A little snippet from the the historical cooking book. Cornish pasty was made with mutton, not beef! Now...DO NOT LET THAT STOP YOU MAKING THEM WITH BEEF! Mutton is not for everyone! There is many ideas about what is a true Cornish pasty when in fact none or all could be true. A Cornish pasty was a Cornish Miners pact lunch and what went into it was whatever his wife or mother had in her pantry at the time. Often they would have been half and half with savoury at one end and sweet at the other (the crimp of the crust told you which end was which) giving you a two course meal in one and for those who didn't want dirty finger marks you held it by the crimped crust which you then discarded but I doubt many miners were that fussy. Four inches is but a dainty; anything from seven to twelve inches is more the size of a true pasty. Thanks for the recipe! I made these for a party recently and they were a big hit. I took the advice of another poster and brushed egg white on them which made them look great. I will say they were a little labor intensive when you make your own puree, but I enjoyed it. Woke up this morning feeling quite in need of a Harry Potter fix; decided to hunt down a pumpkin pasty recipe; voilà! Next time around I'll be using a different (read: better) pastry dough, and maybe lessening the sugar in these. But overall, definitely hit the spot. Thanks! Hey Dear, I love your writing style- You always have a way of bringing in the human experience and delivering a professional piece at the same time. Instead of going just for convenience, begin thinking about how your foods affect your body program. So when you are in the grocery store, add more fresh vegetables and clean fruit than you normally would and stay away from the frozen foods and instant food sections as much as possible to Culinary arts. Hi! So, this may be a silly question, but it says "1/2 t. Allspice", is that supposed to be tbs. or tsp.or something different all together? Small t is tsp. Capital T is tbs. Or at least thats how my family shorthand works. This has blown my mind- I never even considered that they might be sweet. I feel like a pasty should be chunky with sauce or a Cornish pasty. This recipe seems to be a recipe for pumpkin tart that's been put in pastry as an afterthought. Makes me weirdly sad. I'm sure the pasties are savoury, maybe I'm wrong but I think you're reasoning is faulty regardless. A food trolley usually firstly sells sandwiches, pasties, sausage rolls, etc. often accompanied by chocolate bars. Because they're kids (and in any case the magic potential of a sausage rolls seems comparatively lacking ) clearly they'll go more for the chocolate section (and sweets in their case) but Harry offers to swap the pasty, not the sweets, for Ron's sandwich, suggesting the pasty is the closest match. I think you've got distracted by the sweets and forgotten that they are from a food trolley. It would be odd if a food trolley did not have (savoury) pasties, and even odder if there were no savoury foods at all. But each to their own, they may as well be sweet if that's what you want. How far in advance can these be made and still have the same quality as fresh from the oven? 24 or 48 hours?